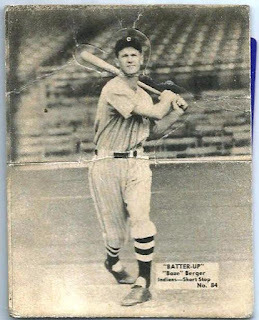 This is a 1934 Batter-Up card of Boze Berger. I bought this card back in 2008 on eBay. At the time, this poor fella was trapped in a PSA-graded sealed containment unit. It was graded Poor-Fair 1, which I can only assume is just as low as you can go. I didn't care. I wanted the card and I wanted to set it free. So, I bought it and did just that. It's hard to tell, but the card is die-cut around the top half of the player such that one could fold the card and create a mock 3-d stand-up of the player. From the looks of it, someone had done that. I did not. It actually looks as though the person folded it in half before punching out the player, thus the crease at the belt line. That's a bummer. 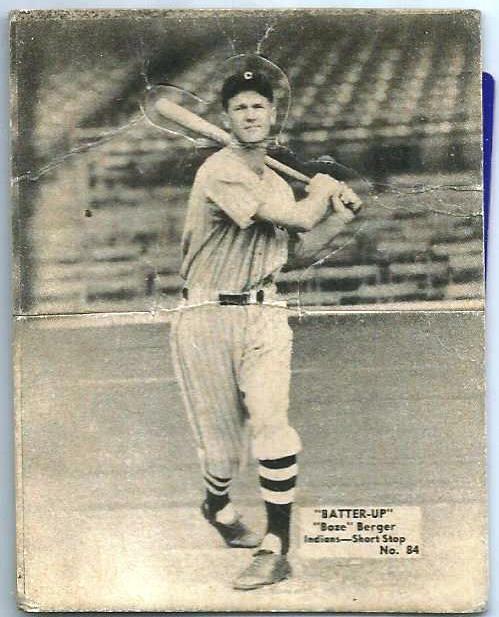 Berger played for the Tribe in '32, '35 and '36. He played all over the infield along the bases. He also played for the Red Sox and the White Sox during his career. As an Indians player, he mustered a .144 batting average. He hit .238 in 1935 with the Tribe, which turned out to be his best season in the majors. As he embarked on that 1935 season, he remarked, "...I’m going to do the best I can and if that isn’t good enough it’ll be just too bad for me." I think a good many players would be served well to hold the same attitude. He gave 20 years of service for his country, serving in the Army then the Air Force. Wow, never seen one of those before. .... I know so little about '30s cards if it's not Goudey.